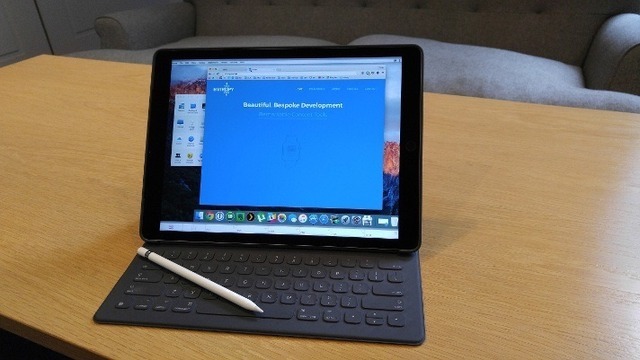 iPad ProとVNCアプリ「Screens」の組み合わせは「OS X on iPad Pro」に最適の組み合わせ？ | AAPL Ch. The beauty of a single machine fully dedicated to the iPad Pro is that we *always* have a full OS X instance at the ready for anything that arises – from exporting and compiling app builds to transcoding video, to downloading and uploading large files. This wonderful little VNC app from Edovia is a dream to use on the iPad Pro – and even though our Mac Mini is based in California (and we’re in the UK), performance is super smooth, with very little latency. The Screens interface is fully customised for iOS 9 multitasking, and is by far the cleanest VNC interface available for iOS (Edovia even make a pretty slick Mac app as well).